HONG KONG - Tencent Holdings Ltd, the world's third-largest Internet firm, aims to be China's Facebook, Twitter and Google, all rolled into one. While the company's market value has quadrupled to $50 billion over the past two and a half years, its revenue and profit growth are expected to slow over the next few years, forcing the company to rethink its future. Tencent is aggressively shifting away from the highly competitive online gaming industry and into China's social networking, e-commerce and mobile search-engine sectors. 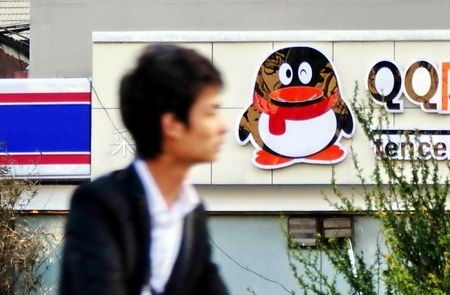 The company, an investor darling whose mascots are a pair of chubby penguins with wraparound scarves, faces many risks, including managing its partners, content regulations and strong competition from rivals such as Baidu Inc, Sina Corp and Alibaba.com. "Tencent needs to look for other gold mines to counter slowing online gaming growth. Otherwise, they won't be able to maintain the strong growth they've had over the past few years," said Hover Xiao, an analyst at the technology research firm IDC. Tencent, which runs China's largest instant-messaging service, QQ, and an online gaming community with 674 million QQ accounts, has been relying on its games business for about 60 percent of its revenue, which totaled 19.6 billion yuan ($3 billion) in 2010. This month, Tencent opened its once-proprietary platform by launching a so-called Q+ platform, an open system championed by Facebook and Apple to attract external software developers to boost users and increase revenue. With this launch, Tencent can allow third-party developers to market their products to the legions of QQ users on the platform through a revenue-sharing scheme. "The idea is to make sure users can do everything they want in an Internet site. It's a way for Internet companies to make sure users stick to their sites rather than go to their rivals," said Jane Wang, an analyst with the UK-based research firm Ovum. Tencent dominates China's $5-billion online gaming market with hits such as Dungeon & Fighter, where players slay monsters, and Three Kingdoms, where swordsmen battle in ancient China. "There is a ceiling in Internet value-added services, so that is giving us a sense of urgency," Tencent founder and Chief Executive Officer Pony Ma said this month. "How can we push the team and company to adjust our DNA and change our business model to get revenues from business-to-business space? It may take five to six years, or even 10 years, but we'll do what it takes," said the 39-year-old, who is among the top 10 Chinese billionaires on Forbes' list. Headquartered in the southern Chinese boomtown of Shenzhen, Tencent is now seeking to capture China's booming e-commerce market, setting its sights on web advertising and online malls after relying on individual online consumers for its revenue over the past 10 years. It also hopes to grab a larger piece of the pie in the wireless search-engine sector, hoping to take the No 2 spot in China in the next few years, Ma said, declining to give a specific timeframe. In the wireless search-engine sector, Tencent now has a 14.7 percent share, ranking behind Baidu's 36.1 percent and Easou.com's 19.1 percent, industry figures showed. With growth in China's online gaming sector slowing to teen percentages from over 20 percent now, Tencent, a third owned by Naspers, needs new ideas to lock in its millions of users. "Investors in the capital markets are bound to give them a lot of pressure, and also they are facing increasing stiff competition in the market," Xiao said. Baidu, China's No 1 search engine, has increased its focus on e-commerce and online video. Last Friday, it said it was buying China's leading travel website, Qunar, to boost its foothold in the search engine market. Sina runs the country's top micro-blogging site, a Twitter-like product that Sina is bent on expanding further. Alibaba is China's No 1 e-commerce company. "Truth be told, we do have some regrets for being way too careful in some areas. We should have started investing when we saw the opportunity and we've paid a price playing catch-up," the lanky Ma told reporters. Over the past five years, Tencent's revenue and net profit rocketed sevenfold, and its annual growth averaged more than 60 percent. But this will slow to about 30 percent over the next two to three years, according to forecasts from Thomson Reuters. With 2011 price-to-earnings ratio (P/E) at 28.16, which outpaces the industry, Tencent is rated by 29 out of 34 analysts as a buy or strong buy, with four recommending a hold and one rating it underperform. Competition in the Chinese online game sector is cut-throat as competitors such as Shanda Games and Changyou.com up their ante. Eric Wen, analyst at Mirae Asset, likened Tencent's launch of Q+ platform to China's transition from a planned economy to a market-oriented one. "We believe at a time of limited content supply and poor infrastructure, Tencent's planning economy actually works. But as bandwidth opens up and content supply multiplies, Tencent must transition to the 'market economy'," Wen said in a research report.